The Norton 4 and I have formed a close bond. They arrived here in September having lived in a garden most of their young lives. They’d been fed by a kindly neighbour but not had much human interaction, and were terrified. It’s been a long slow process but by Christmas it was clear that they all trust me and in varying degrees are happy for me to stroke and cuddle them. Dodger and Bandit are more wary. Dodger is way bigger than his sisters but on the whole a bit of a wuss … maybe it’s because they push him around … girl cats can be very bossy. I have a very strong sense that he’s a big soft tom cat waiting to happen though. He was the last of the group to allow strokes, but now clearly enjoying them and wanting more, but not quite ready to risk it. Bandit on the other hand was the first of the group to allow contact, but now seems to be the most wary. Her weakness is chicken … which is perhaps how she was the first to be bribed when they arrived. Dodger has never been one for chicken … he’s more a Dreamie man and is loving the Dreamie toy he got at Christmas from Jess his cat sitter. What we’ve realised though is that although they’re confident with me, they’re not used to anyone else really and tend to hide when other people are around. It’s understandable given that it’s just me that they see every day … but it’s not a winner in the adoption stakes. I get where they’re coming from. I’m not very confident with new people either. I’d dragged every random visitor I’d had into their room to meet them briefly but it wasn’t going to be enough to help them. So one evening over the Christmas holiday we posted on a local facebook group asking for help. It was a bit of a weird request … asking random cat loving strangers to come over for an hour or so, sit with me in their room and just chat so they got used to other voices, and if they came out to interact at their own pace. There was a flurry of interest which resulted in four serious offers and dates in the diary. I think all 5 of us were anxious, though at least I was also hopeful and optimistic. The first visit was less stressful for me as it was one of our adopters from years ago, Elisha & Ezekiel’s mum. Nancy bobbed out to play a bit and even had a little stroke. The others hid. Second visit was a kind lady and her amazingly calm and lovely kids. 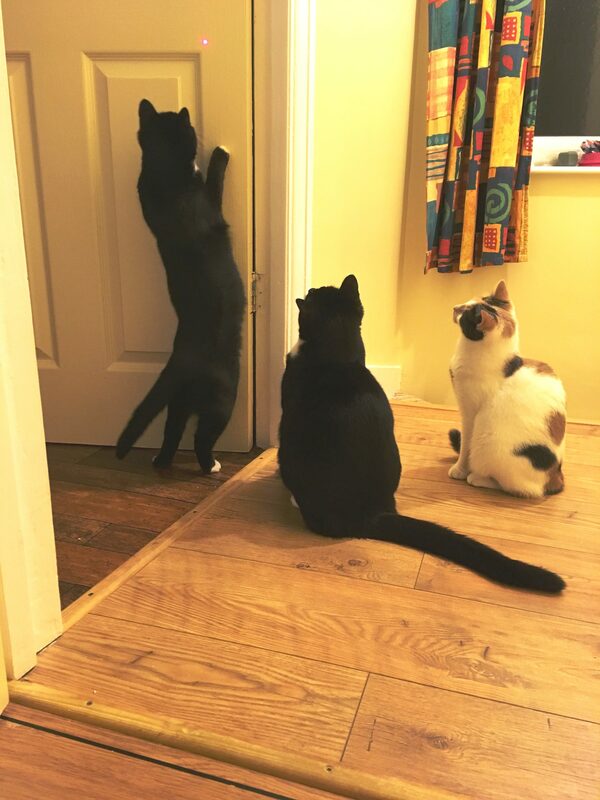 Norton 4 had never been matched by same number of humans in their room before so it was a big event for them. Again Nancy popped out to say hello … and to the kids delight shot off after smelling mum’s feet 😉 I’m sure it was just the smells of other pets she’s picked up on her socks but it caused some hilarity. Our third brave visitor also had a snuggle with Nancy but not much sight of the others. I’m hugely grateful to these people who responded to our request for help. Despite it looking as though nothing was changing, under the surface it was! What I’ve consistently found with cats is that it looks like nothing is happening … and then suddenly there’s a shift. Our fourth awesome guest managed to charm Nancy out to play very quickly, not surprisingly as Nancy had been the main meet and greet purrson previously. That was lovely but not ground breaking. However, it started to get more exciting when Fingers put in an appearance. That was amazing. It made my day really … huge progress. Then we noticed that Dodger was just visible around the side of the filing cabinet. That in itself was a big deal as he’s normally hidden much more securely than that. I was blown away when he also came out to play. 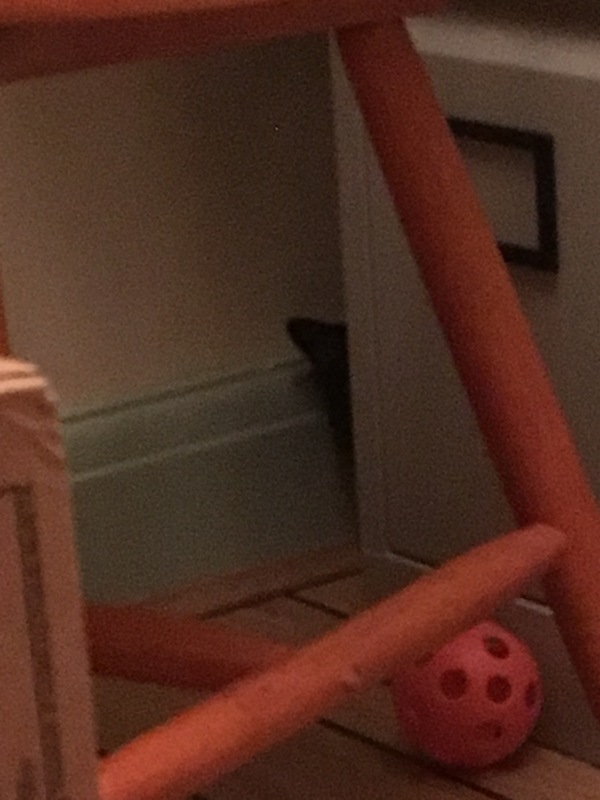 And then Bandit too … she gave up her rigid “in the corner behind the desk” hidey hole … and joined in the game. Then Dodger was taking treats out of her hands and Finger was climbing on her lap like she was a long lost friend. This is so exciting and hopeful for the future of these cats. 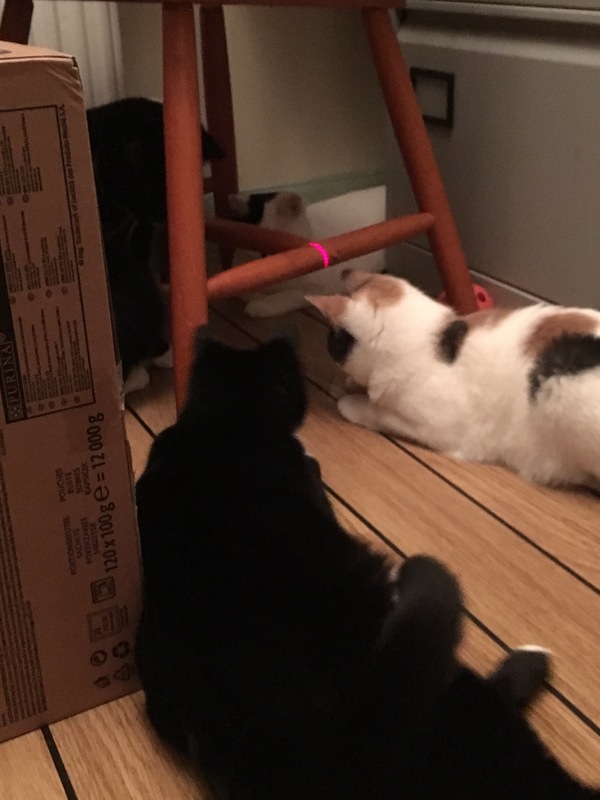 Their increased confidence was sustained when our adopter friend came for a second visit … the cats were markedly more outgoing with her too. 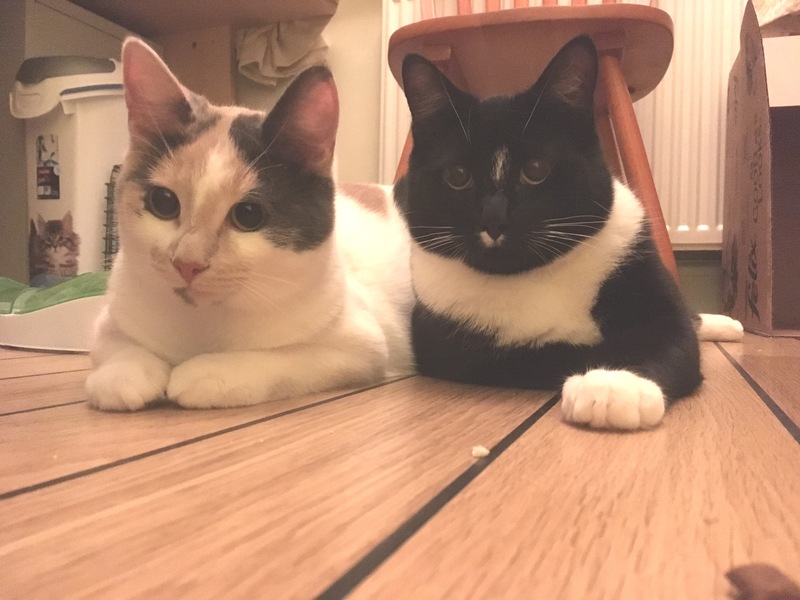 They’re still going to be a bit wary of new people and take some patience to gain their trust and confidence … but I’m sure once they’re settled in their new homes they’re going to be amazing.